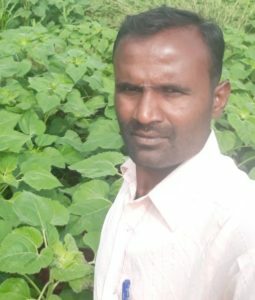 “Sunflower farming has been profitable for me as production cost is less when compared to watermelon, tomato, beans etc.,” says Mr. Manjunath TH, progressive farmer from Thondavadi village, Chamarajanagar district, Karnataka. 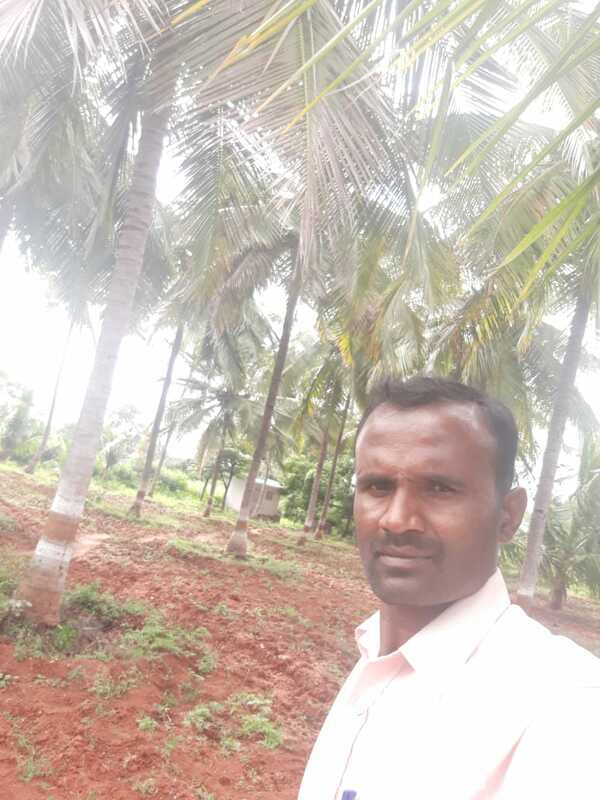 Mr. Manjunath completed his education in 2006 and since then he is an agriculturist. He grows sunflower, sweetcorn, tomato, watermelon, foxtail millet, coconut, and black eyed beans in 4.15 acres. “I cultivate sunflower along with groundnut and finger millet (ragi) as mixed crop. 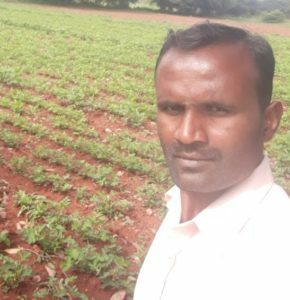 I grow one row each of sunflower, groundnut and ragi. It gave good production,” he adds. Farm has three local origin desi breed cows called “Ilathi’ and 4oxen. Earlier Mr. Manjunath was into conventional farming but since 2013 he has switched to organic farming. “I got lesser yield for the first two years during the conversion period. Later to which the yield of all crops has improved,” he shares. This year he has cultivated hybrid sunflower variety too along with desi sunflower seeds in order to do a comparative study of cost-benefit ratio. Desi sunflower plant is short in height and has small leaves unlike the hybrid varieties. “Hybrid sunflower variety 23 has been developed and distributed by Haradhanahalli KVK. This variety has thick stem with large and healthy leaves. The oil content might also vary. I receive lot of assistance from Haradhanahalli KVK,” he states. To grow sunflower, the first step is to level the farmland and till it thoroughly. The soil must then be fed with cattle manure. “3 tractor load manure is needed for 2-acre farmland. It is tilled with rotavator and land is left as it is for 10-15 days. Approximately 5 kg seed is required for 2-acre farmland. Next it is the time to sow the seeds keeping the plant to plant distance 8-9 inches while 1.5feet distance row to row. It has to be ensured that farmland soil is loose and has good moisture content so that the plants grow well. Irrigation can be done either naturally through rain or drip/sprinkler,” he explains the farming intricacies to grow sunflower. It is possible to intercrop seasonal vegetables with sunflower. Desi variety of sunflower yields 4 qunital/2-acre while hybrid variety is expected to produce 8 qunital/2-acre. Selling is the only challenge for Mr. Manjunath. “I still need to identify the right buyer for my produce. Till now, I sold sunflower seeds in Mysore Agriculture Products market. This market has volatile pricing due to bidding.However, this year as I am also growing hybrid sunflower variety for KVK Haradanahalli, hopefully they should purchase for me else I will sell it as usual to the traders in Mysore Agri Products Market,” he says. Previous PostPrevious Amrendra Pratap Singh – Progressive farmer from Uttar Pradesh.